Usually, I don’t like to name names when people ask, “What is the best pet food?” What works best for one pet will give another one tummy problems, and still another one won’t even touch it. Variety is extremely important for our cats and dogs. Feeding the same food year in and year out is a good way to create food intolerances and allergies, as well as finicky behavior; and it puts pets at risk for serious deficiencies or excesses. One cat rescue that fed only Wellness canned food had many cats get sick, and several die, due to the lack of thiamine in food that was later recalled. For these reasons, I strongly recommend feeding your cat a variety of different types, brands and/or flavors of food. For instructions on getting your cat to eat different foods, please read our article on Switching Foods. The very best diet you can feed your cat is a properly balanced, species-specific, raw homemade diet using fresh, organic foods; and secondarily, a commercially made, nutritionally complete raw diet. That said, I recognize the reality that a lot of people are just not able to do that. Canned food is the most practical and do-able way for many folks. Now, I do publish a complete list of “Dr Jean’s approved brands” in my ebook, What Cats Should Eat: How to Keep Your Cat Healthy with Good Food, which I update frequently. But if you don’t want to buy the ebook, I will, just this once, tell you about my favorite canned cat food! 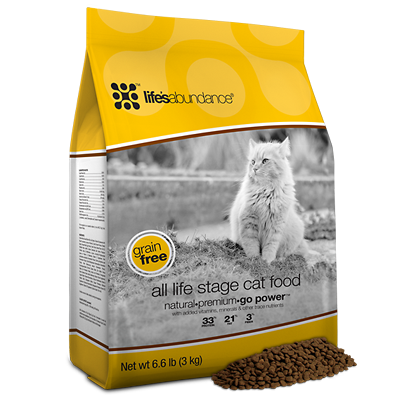 Life’s Abundance pet foods are formulated by Dr. Jane Bicks, a fellow veterinarian and long-time friend. I gave Dr. Jane no end of hassle for years, until she finally came out with a canned cat food: Instinctive Choice. I believe this is absolutely the highest quality, lowest-carb, cat-friendliest canned food available anywhere. Cats love it, and it has saved many lives when kitties wouldn’t eat anything else. A few years ago, my youngest cat, Sundance (now 17), suddenly developed a life-threatening condition called idiopathic hypercalcemia. He would sniff at food and maybe take a bite or two, but that was about it; so he was losing weight fast. As it turned out, Instinctive Choice was the only food he would eat, and it helped him to get “back on his paws.” Of course, he was also getting holistic treatment with homeopathy, acupressure, Reiki, etc. ; but without “good groceries,” the body simply doesn’t have the resources to heal! I believe that this food helped save his life. Did you catch that crucial concept? No matter what remedies or supplements or therapies we give our cats, nutrition is still the foundation of it all. If that foundation is weak or crumbling, it must be repaired, and the only way to do that is with healthy, wholesome food. Instinctive Choice makes a good solid brick for that foundation. But…as much as I love this food, and as well it can serve as the foundation of your cat’s diet; variety is still critically important, so please incorporate other wholesome, natural brands in your rotation. SAMPLES: Life’s Abundance now offers single cans of food, so you can try it! Just click on the order button and select single can. For cats with CKD (chronic kidney disease): This is a very high protein food. While older cats absolutely need adequate high quality protein as they age, research suggests that CKD cats may live longer with fewer crises when given a restricted-phosphorus diet. However, the protein issue is still controversial. The phosphorus level of Life’s Abundance canned food is 0.29%, and in the dry food it is 0.8%. You should discuss any major food changes with your veterinarian, but since the answer will almost certainly be “no,” we do NOT recommend this food for cats with advanced kidney disease. On the other hand, this food will often tempt even sick cats to eat, so it may be useful for that purpose. Please note: Technical questions about this food, such as levels of particular nutrients, should be directed to the manufacturer (877-387-4564) and not to Little Big Cat or Dr. Hofve. We cannot advise you on the appropriateness of this food for individual cats or any particular medical condition. Instinctive Choice can be ordered directly from Life’s Abundance by the case OR by the single can. Click on the order button below to visit their website; or keep reading for more detailed information about this food. Life’s Abundance products are not available in stores. For all technical questions (such as specific nutrient levels, ingredient information, processing questions, etc. ), please call the company directly at: 877-387-4564, 8:00 AM to 7:00PM EST, Monday-Friday. We are pleased to announce that Life’s Abundance has been named as a Certified Evergreen Company. Instinctive Choice does not contain fruits (such as cranberries or apples), vegetables (such as sweets potatoes or carrots) or grains (such as wheat, barley, corn or oats). Cats are metabolically adapted to use protein and fat as energy sources and they have no metabolic need for carbohydrates. Most domestic cats, however, need a little fiber because their digestive tracts are used to getting it. Guar gum is an excellent source of fiber. Instinctive Choice does NOT contain corn or corn gluten, wheat or wheat gluten, artificial colors or artificial preservatives. What is in Instinctive Choice and why is it better? Instinctive Choice premium canned cat food is nutrient dense; therefore, you can feed less of Instinctive Choice than many other brands of canned cat food. Instinctive Choice contains high-quality proteins from meat and seafood. The organic chicken, turkey, chicken liver and shrimp are carefully selected to provide your cat with a variety of protein sources. 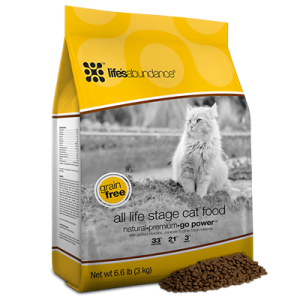 This ensures that your cat will get a full array of proteins and amino acids that true carnivores need to live a healthy life. The chicken liver in Instinctive Choice not only provides a rich protein source, it is also a powerhouse of nutrition because it contains Vitamins A, E, C, folic acid, B vitamins, iron and copper, just to mention a few. Instinctive Choice contains nutrient-rich water. This is important because modern house cats are descended from desert wildcats that obtained moisture from their prey. Cats will not drink water from a bowl unless they are very thirsty; in other words, dehydrated. The nutritional components found in meats and chicken broth allow your cat to obtain moisture the same way a cat in the wild would get it. Cats crave grass; in fact, every species of wild cat consumes grass. Instinctive Choice contains dog grass extract, which provides chlorophyll, an important antioxidant. Instinctive Choice contains a guaranteed amount of added omega-3 fatty acids from fish oil and omega-6 fatty acids in a ratio that is beneficial for overall health. Instinctive Choice contains added chelated minerals, which are closer to those found in nature, so they are absorbed better. Instinctive Choice contains a guaranteed amount of added vitamin E, a powerful antioxidant important to good health. Instinctive Choice contains added inulin, a prebiotic that supports a healthy intestine, a healthy immune system and increased nutrient absorption. Instinctive Choice contains a superior blend of vitamins, minerals, and antioxidants to help contribute to a healthy daily diet. Instinctive Choice has a savory taste that your kitten or cat will love. The organic chicken, turkey, succulent shrimp and chicken liver are cooked in a delicious broth that is seasoned with a little bit of rosemary. * My cats also love the Life’s Abundance Wellness Food Supplement for Cats… they come running when I shake that jar! The company offers a 100% satisfaction guarantee, so if your cat will not eat the food, you can return the remainder for a refund. Please contact the manufacturer directly (877-387-4564) for all questions about shipping, returns, or order status. Please read our article on Switching Foods and follow the guidelines, in order to maximize your cat’s acceptance of the new food. NOTE: Life’s Abundance is a network marketing company, so there is a business opportunity there for those who want to work it. Click the Order Now button, then on the middle button on the top that says “Opportunity” to learn more.